Now, the publishing process takes a little while and it is really hard for me to keep these things under wraps. So you can imagine my excitement when I was sent the cover image and found my little Rosy Lullaby inserted on the front cover as the PLUS addition ;) Squeal #2!!! So ya, basically a lot of squeals going on over here today. Maybe even a happy dance or two :) And with that, I wish you all a Happy Quilting Day!!! Congrats. Being published is very exciting news indeed. congrats!! The quilt is darling! Congratulations. How exciting for you. Your quilt is really cute and I love how you quilted it. Is is ok if I practice fmq from your design? Congratulations! That is fabulous and you should be very proud of your acomplishment. a HUGE congratulations Melissa. Your quilting looks great. I saw this in the magazine before you posted it. I guess I got my copy early for some strange reason. Right now I'm on working on First quilt. Wahoo!!!! So excited for you. It's a lovely quilt and the quilting looks great. Well done. Congratulations! Your quilt is very pretty and the quilting looks beautiful. Congratulations on the publication, Melissa. It is an adorable quilt that could take on all kinds of flavors based on fabric choice--so I think a lot of people will find it useful. I'm so glad some people, like yourself, are willing to submit quilts that are nicely quilted--after years of seeing so many quilts with quilting that was clearly just an afterthought. that's wonderful Melissa! congratulations - the quilt is gorgeous, you should be VERY proud!!! Oh my goodness, what BEAUTIFUL quilting on the back! Nice work Melissa! Congratulations Melissa. The quilt is delightful and the quilting on the back is beautiful. Congratulations Melissa. This is a lovely quilt. I love the simplicity and the machine quilting you did. So very feminine. That is such a darling quilt! Congrats on the publication and shout out on the cover. Very cool! You did a great job on the quilting. Those little flowers look amazing. Very cute! Love your quilting. Congrats on the Magazine! That's awesome. Yay for you!!! Such a cute quilt with awesome quilting!!! How exciting to have one of your quilts published in a magazine!!! Congratulations!!! Congrats! Very cute quilt with wonderful quilting! Great job!! Congatulations. I added a couple of squeals of delight for you, too! So exciting. We are so very proud of you. Congrats!! I love the quilting you did on it too! Congratulations! It's beautiful and I love the quilting too. congrates! Soon you will have soo many "in the pipelines" that you won't have to wait because you'll have ones being published all the time! Congrats! And your quilting is great. Congrats! I saw a reply by Gene Black and had to Google Rosy Lullaby. When I saw it was the bonus free pattern I immedately printed it! Great layout and pattern. You just make pretty seem so easy. Definitely worth all those squeals! Love the quilting and I agree this would be a great quilt in a boyish colorway. So fancy! I love the quilting! I'd be squealing all over the place too if it was me. Congrats! Congratulations!!! 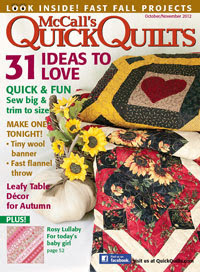 I must admit that when I received my magazine, the Rosy Lullaby quilt was one of my favortes! Love the quilting!! Yay for you! Congratulations!! The quilt is gorgeous and so is the quilting. I'm thrilled that you are also the Web bonus. I'm sure there will be many more published quilts in your future. I love, love, love this quilt. I want to do it in an 80x80 version for my cabin, so will have to figure out the pattern/plan for that. 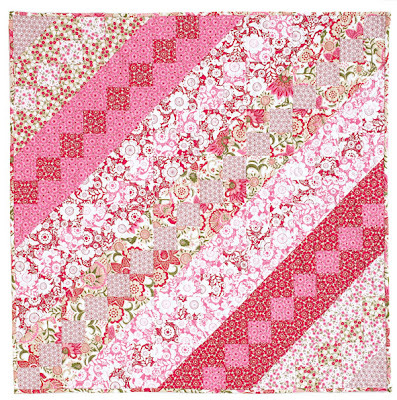 In the mean time though I am making your girly version in pinks from my stash to get practiced up for the cabin quilt. Thank you for this!! !